The single best way to avoid eye infections is to follow proper lens care guidelines as prescribed by your eye care professional. 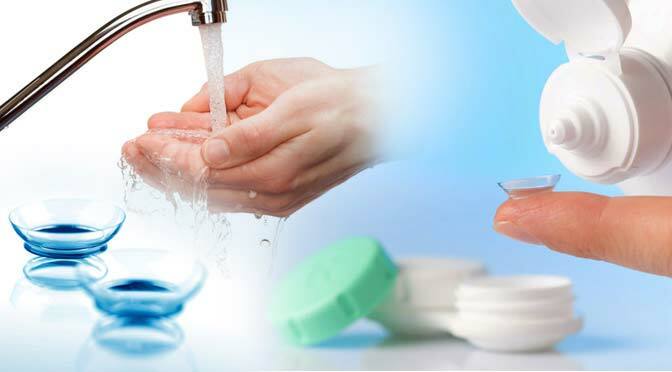 In particular, including a "rub and rinse" step in the lens cleaning process, minimising contact with water while wearing contact lenses and replacing the lens case frequently can help reduce the risk of infection. The following guidelines for care of contact lenses have been developed in partnership by the American Academy of Ophthalmology, the Contact Lens Association for Ophthalmologists, the Cornea Society and the American Society of Cataract and Refractive Surgery. Risk of infection varies somewhat depending on the type of contact lens. Single-use daily disposable lenses are the safest type of soft contact lens, in terms of reducing the risk of infection. Rigid gas permeable lenses are a safer alternative than any type of soft contact lens. Your ophthalmologist can help you decide which type of lens is right for you. Regardless of the type you decide on, proper care of the lenses is essential to eye health. Before handling contact lenses, wash your hands with soap and water, then rinse and dry them with a lint-free towel. Minimise contact with water, including removing lenses before going swimming or in a hot tub. Contact lenses should not be rinsed with or stored in water (tap or sterile water). Do not put your lenses in your mouth to wet them. Saliva is not a sterile solution. Do not use saline solution and rewetting drops to disinfect lenses. Neither is an effective or approved disinfectant. Follow the specific contact lens cleaning and storage guidelines from your eye care professional and the solution manufacturer. 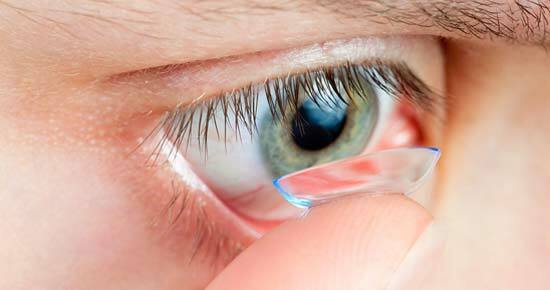 During cleaning, rub your contact lenses with your fingers, then rinse the lenses with solution before soaking them. This "rub and rinse" method is considered by some experts to be a superior method of cleaning, even if the solution you are using is a "no-rub" variety. 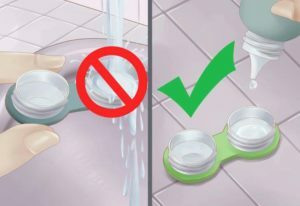 Rinse the contact lens case with fresh solution — not water. Then leave the empty case open to air dry. Keep the contact lens case clean and replace it regularly, at least every three months. Lens cases can be a source of contamination and infection. Do not use cracked or damaged lens cases. Do not re-use old solution or "top off" the solution in your lens case. 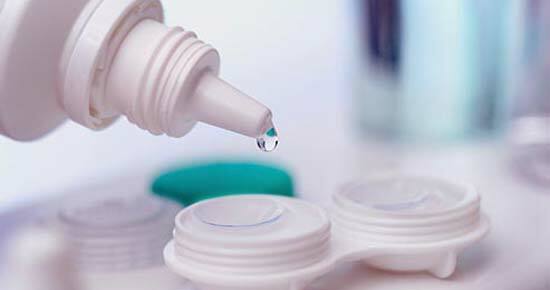 Do not transfer contact lens solution into smaller travel-size containers. This can affect the sterility of the solution, which can lead to an eye infection. Do not allow the tip of the solution bottle to come in contact with any surface, and keep the bottle tightly closed when not in use. If you store your lenses in the case for an extended period of time, consult the instructions for the lenses or the contact lens solution to determine if re-disinfecting the lenses is appropriate before you wear them. In no case should you wear your lenses after storage for 30 or more days without re-disinfecting. Some experts recommend that if you use contact lenses sporadically you consider using single-use daily disposable lenses. Eye infections can lead to serious vision loss in some cases. Proper care of your eyes is just as important as proper lens care. Remove the contact lenses and consult an ophthalmologist immediately if you experience symptoms such as redness, pain, tearing, increased light sensitivity, blurry vision, discharge or swelling. If you smoke, stop. Studies show that contact lens wearers who smoke have a higher rate of problems than non-smokers. Beware of using decorative lenses, such as those often sold at costume shops. These lenses have the potential to damage eyes permanently. Get regular eye exams. If you wear contact lenses, you should be examined by an eye care provider annually, and more often as needed. As with any prescription, contact lens prescriptions do expire — typically within one year. You should see your eye care professional yearly to ensure they continue to have an accurate and appropriate prescription. These regular exams are also important opportunities for reinforcing proper lens care.